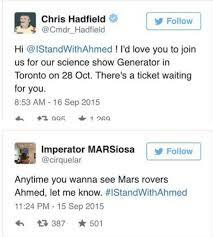 Good for Ahmed! But we still have problems. Last week 14-year-old Ahmed Mohamed was arrested for making a clock, because the circumstances of the situation led those in charge to believe that it might be a bomb. Are we really living in an era where a home-made clock created by a high school student with a passion for inventing has no place at a school? I’m not sure if in the history of our public education system there has been a more confused time for striking the right balance of quantifiable measurement and intuitive teaching, standards and freedom to explore, serving the gifted and addressing the challenged and giving the best opportunities to everyone else, and providing the right learning environment for kids who have abundant resources and those who are simply just hungry. Perhaps my teacher friends can confirm or deny this, but judging from all that is said and written about education today, we are faced with a crushing number of issues. Many of our educators disagree with how political leaders are addressing them. Thanks to my teacher friends and family, I read a lot about how standards impact those who have a hard time in the classroom, whether due to abilities, home environment, racism or otherwise. But I also see how creating a narrow channel for our teachers to draw from debilitates kids who aren’t fully served by what happens in the classroom. Should we expect someone like Ahmed Mohamed to stifle his excitement for what he discovers, what he can do, and not share it with his teacher because it is atypical? Has our educational system has become so rigid that kids are no longer expected (or welcome) to “color outside the lines”? This boy, like other “maker” kids, goes beyond the standards to take ownership of his learning experiences. Some might call it inspired. Ahmed Mohamed is Muslim. He lives in a community where the mayor has had a strained relationship with the Muslim community. Some of the things that were said to him when questioned indicate that his religion had some influence on how the situation was being treated. My son attends an enrichment program for kids who like to and have the talent to invent, run by one of this country’s most prestigious universities. The requirements to attend are fairly narrow, so I can’t say it is a diverse group on the whole. But when I show up to drop him off and pick him up from his classes, the kids, parents and teachers I see have different skin colors. The groups are not fully representative of all the major world races and ethnicities, but there are kids there who look like Ahmed Mohamed and others who do not look like my white son. It’s not the perfect picture of diversity, but isn’t this the kind of direction we want head toward for our kids? What shouldn’t have a place in school are the hard decisions administrators have to make about how to keep their students safe. Obviously in some places they need more guidance on what should be perceived as a threat. A simple home-made clock lands a kid in police questioning, but in some states his father wouldn’t have to leave his gun in the car to come in and pick him up from the principal’s office. We need another phrase to describe this inconsistency of logic, because “messed up” is inadequate. Shouldn’t we be more afraid of people who have made it easier to bring weapons into schools than adolescents who like to tinker with circuit boards and digital displays? Ahmed’s story has a fortunate ending. But even after he gets back from the White House and Facebook headquarters, the factors that influenced what happened will still be the same. Looks like this incident will turn out fine for him. And like so many others, #IStandWithAhmed. But we all know that there will be other kids like Ahmed who won’t be so lucky. What are we going to do about that? This entry was posted in There -- I Said It and tagged #IStandWithAhmed, Ahmed Mohamad, educational reform, gifted students, gun control, guns in schools, home-made clock, parenting, racism.